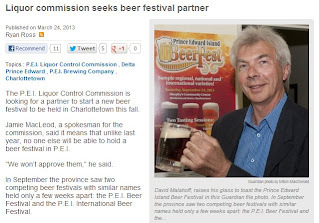 Two Septembers ago, Campbell Webster put on PEI's first beer festival. He invited Gahan / PEI Brewing Company, and they wouldn't come. I've heard different reasons from they didn't have enough beer to they were going to have their own Oktoberfest within a month (which didn't happen). The fest was pretty good, although there was some room for improvement. Before and after, Campbell even consulted with myself and other local beer fans for ideas. He was (is) keen to listen and improve upon what he does. Fast forward to this past September. Campbell puts the fest on again, in a better venue, and improved upon the previous year's fest in many ways (he lost a brewery or two from the previous year, but gained some, as well). Even though his fest was in mid-September, the PEI Brewing Company put on their own "first annual" PEI International Beer Fest (no more international than the other) at the end of the month, and got it listed as part of the Fall Flavours festival. Rumours went around about some "just business" kinds of things in trying to ensure theirs was the best (or only) fest on the go. "...looking for a contractor to organize, manage and partner with the commission on a new beer festival. Under the criteria for the proposal, the contractor will organize and supervise the festival, while the commission will provide promotional material and own the event’s website. The commission will be able to renew the contract with the successful party on annual basis, provided there is a satisfactory performance evaluation. Under the proposal, the contractor will have to maintain a minimum $5 million in commercial general liability insurance and a further $1 million automobile liability." Only Campbell Webster is quoted in the article, and he says he likes the idea and is planning on submitting a proposal. That being said, it would be hard not to bet that the Murphy/Gahan/PEI Brewing Co. group would have deeper pockets for a bigger bid as well as stronger political ties. What're your thoughts? Could PEI not support two events in a year, just more spaced apart (Can't we all just get along?)? Should the gov't take control of such an event and limit its existence to once a year (in Sept. / Oct.)? Will this ensure a better yearly festival? Would brewers rather show up for a fest run by a promoter, another brewery, or a branch of the provincial gov't? Why can't I remember that other question I was going to post? I have no evidence to back this up, but it appears to me that we might have a small (but growing) micro starting to behave like a large multi-national macro.